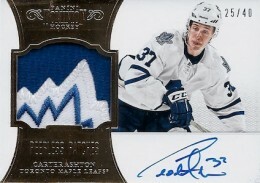 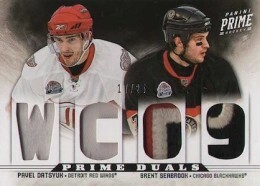 2012-13 Panini Prime Hockey offers up some of the rarest cards and more unique memorabilia cards of the season. 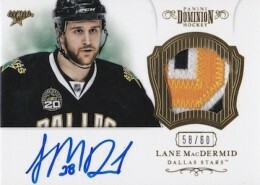 Already a high-end brand, it has been taken up a notch by folding in content from the company's other exclusive brand, Dominion. 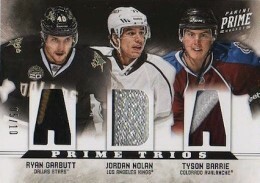 Every box of 2012-13 Panini Prime Hockey has at least three major hits. 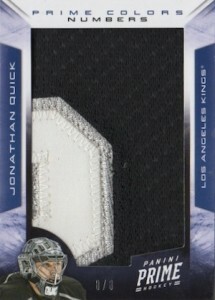 Kicking things off is a Rookie Autograph Quad Jersey card. 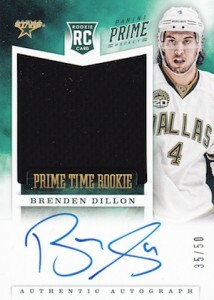 Although the checklist is limited to players who debuted late in 2011-12, the set represents some of the top rookie cards of the year. 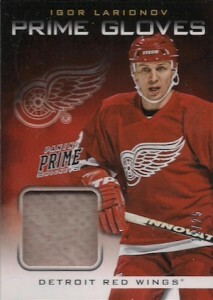 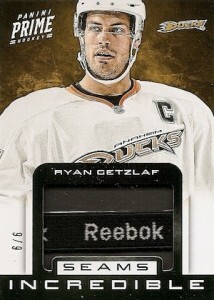 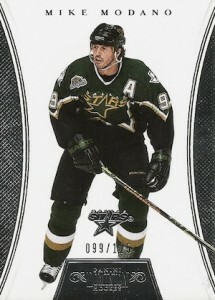 2012-13 Panini Prime Hockey has a rare memorabilia card in every box as well. 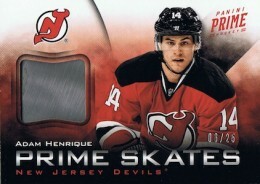 Prime Ties, Prime Laces, Prime Gloves and Prime Skates all come with large pieces of gear rarely seen on cards. 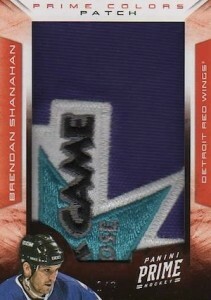 Other memorabilia cards deliver massive patch pieces that are instantly recognizable as logos, numbers and nameplates. 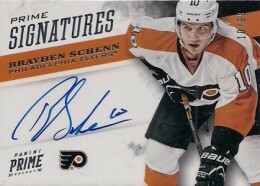 Besides the promised rookie autograph, boxes also have another signature card. 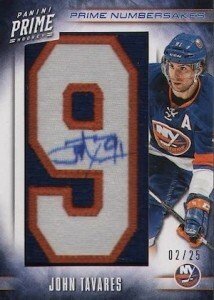 Among them are Prime Signatures Trios, which have autographs from three premier players. 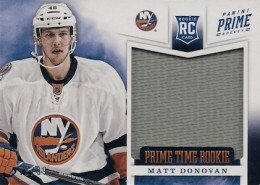 Although Panini isn't producing Dominion for the shortened hockey season, it's not gone completely. 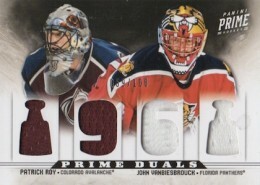 There's a two-card Dominion bonus pack in every 2012-13 Panini Prime Hockey box. 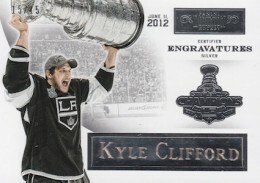 Dominion cards include Engravatures, which celebrate Stanley Cup champions, Peerless Patches and Rookie Autograph Patches. 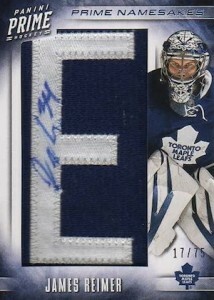 Shield Autographs are available under both the Prime and Dominion banners. 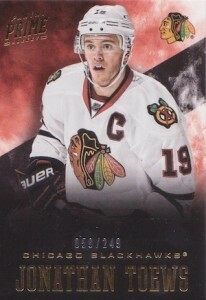 I think this product is fantastic! 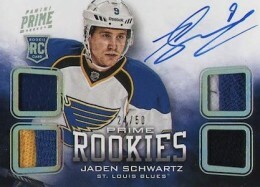 The cards look amazing once again this year, but weak rookie class really brings the product down for me. 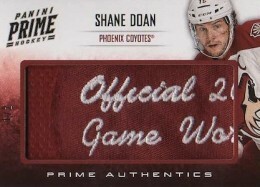 Also, I have notice that there is WAY too many Flyers cards in the product, they take up way to much of the “Big Hits”, and I find it very biased. 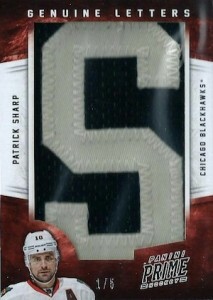 There must have been a Philly fan in the production of this product.